Lady’s mantle is a low growing herb that produces delicate wisps of clustered yellow flowers. While historically it has been used medicinally, today it is mostly grown for its flowers which are very attractive in borders, cut flower arrangements, and in containers. Keep reading to learn more about how to grow lady’s mantle in containers. Can you grow lady’s mantle in a pot? The short answer is yes! Relatively low growing and usually forming a clumping or mounding habit, lady’s mantle is well suited to container life. A single plant can reach a height of 24 to 30 inches (60-76 cm.) and a spread of 30 inches (76 cm.). However, the stems are thin and delicate, and the flowers are numerous and heavy, which often means the plant droops down under its own weight. This makes for a more mound-like formation that is well suited to filling in space in a container. If you are following the thriller, filler, spiller technique when planting your containers, lady’s mantle is an ideal filler. 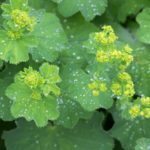 As a rule, lady’s mantle prefers partial to full sun and moist, well drained, neutral to acidic soil, and container grown lady’s mantle is no different. The main thing to worry about with potted lady’s mantle plants is watering. Lady’s mantle is a perennial and ought to be able to grow for years in its container. In its first year of growth, however, watering is key. Water your container grown lady’s mantle frequently and deeply in its first growing season to help it get established. It won’t need as much water in the second year. While it needs lots of water, lady’s mantle doesn’t like waterlogged soil, so make sure to use a well-draining potting mix and plant in a container with drainage holes. Lady’s mantle is hardy in USDA zones 3-8, which means it can survive outdoor winters in a container down to zone 5. If you live in a colder climate, bring it inside or provide winter protection.